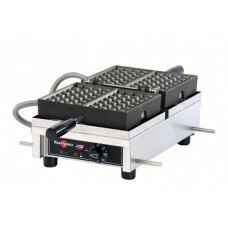 The Krampouz waffle maker is equipped with cast steel iron waffle plates in a stainless steel frame. The cast steel iron plates are key to any professional Liege waffle iron, as its physical properties allow the irons to retain maximum levels of heat as well as provide homogenous heat distribution. It additionally contains a patented "Heating Element Pack" that provides optimal heat distriution throughout the iron plates. Its thermostatic control and heating indicator allows you to precisely control the cooking temperature between 122 - 572°F (30 - 300°C). 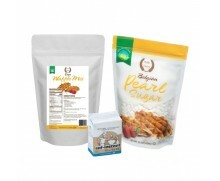 This is ideal to achieve the caramelization effect of pearl sugar in Liege waffles. The waffle iron's opening range is a full 180°, granting perfect distribution of dough over both surfaces. The design of the waffle iron allows you easy removal of the iron plates for easy and thorough cleaning. The stainless steel frame is durable and equipped with protected controls for easy care. The waffle iron also includes a drip tray to prevent spills. We carry this iron in stock (not dropped shipped) and can ship the same day to you. Please read the Waffle Pantry Exchange & Return Policy, as this item is a special order conducted with the manufacturer. Love the machine! Great bake on the waffles and clean up is SOOOOOOO EASY! We will be purchasing another! YES IT IS PRICEY! But shop around and Waffle Pantry to date, has the best price PLUS It is nice to be able to call and TALK with and EXPERIENCED person as far as answering questions about the Waffle Iron or its use or care.. NOW as far as the IRON, CAST IRON COMMERCIAL GRADE EQUIPMENT! Rebuild-able if a part fails and easy to disassemble if need be to clean, I seasoned it as per instructed, I used laser temp gauge to see actual heat. It Takes about 30 minutes to heat up to 190 celsius which I have found best to cook Belgium waffles 190-200c WELL BUILT! I am adding waffles to my business menu My 3000 watt Generator supplies ample electricity to operate the Iron and I believe this machine will do the trick! If your serious about Waffles, This Waffle Iron and Waffle Pantry is the place to shop..Go Big! Or go home! lol.. If you are planning on commercial Liege wafel production or just want the best iron for your home use, this is a fantastic iron. Consistent, reliable, retains heat, and easy (well, easier) to clean. It is well worth the cost, and no one is more knowledgeable or helpful than Waffle Pantry. They are more than a vendor, they treat you like a partner. If you are in Michigan, feel free to come by Revel Bros Ice Cream & Wafels in Rochester Hills and see/sample the iron and the Liege wafels!